Bet the Rams over the Cardinals at -480 with 888Sport. Bet the Steelers over the Chiefs at -225 with 888Sport. Bet the Chargers over the Bills at -335 with 888Sport. Bet the Bucs over the Eagles at +143 with 888Sport. The NFL football season is off to a wild start, as one would expect from the uncertainties of Week 1, creating some interesting opportunities for NFL betting fans. This has to be seen as the moneyline go-to game of the week. People will have to put up a lot of money to win a reasonable payoff, but the investment should be worth it. 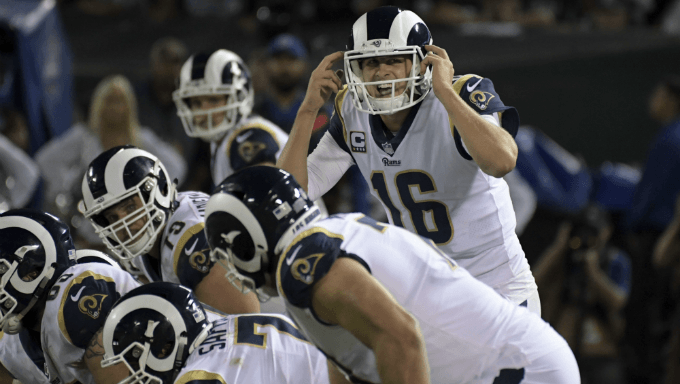 The Los Angeles Rams have a superstar-laden lineup while the Arizona Cardinals are a team that’s lost at sea – already. They looked very disorganized and impotent under new head coach Steve Wilks. The offense totaled just 213 yards at home to the Washington Redskins, and keep in mind that almost a quarter of that came on two passing plays. Sam Bradford doesn’t have good targets to throw to or a reasonable offensive line blocking for him. He finished with a QBR of just 25.9. The bigger concern here is that this was at home and against the Redskins. Now the Cards go on the road to face a much tougher opponent in Los Angeles. We love the Rams at -480 with 888Sport. This will be a very fascinating game. The Chiefs were impressive in a Week 1 win over the Los Angeles Chargers, while the Steelers could only muster a tie with the Cleveland Browns. However, the Steelers tend to play to the level of their competition, so expect them to step up this week. Kansas City quarterback Patrick Mahomes, who now has the keys to the car of Andy Reid’s offense, dazzled in his opening day debut against the Los Angeles Chargers. But going on the road in back-to-back weeks and winning both games is really tough in this league. Also, what was lost in the Chiefs win is how many times the Chargers shot themselves in the foot. They dropped at least two long touchdowns early in the game that could have changed the flow of the contest. Look for the Steelers to look far less sloppy after turning it over six times last week. Bet the Steelers at -225 with 888Sport. Speaking of the Chargers, they were sloppy, undisciplined and unprepared last week. This week, they should be in much better shape. That’s because they’re visiting a Buffalo Bills teams that were easily the worst-looking team in Week 1. They were pummeled 47-3 in their loss at Baltimore. The quarterbacks combined for just 70 yards passing and they only had 153 yards in total – 46 of which came on the game-ending drive. They didn’t even have a first down until the second half. Their offensive line is a mess, their quarterbacking is awful and their defense was walked all over. As long as the Chargers are mildly focused in this game, they’ll win. Take the Chargers at -335 with 888Sport. The Eagles still don’t have Carson Wentz, and they did not look good on offense in Week 1 against Atlanta. The Buccaneers, on the other hand, looked incredibly and surprisingly good on offense with Ryan Fitzpatrick torching the New Orleans Saints on the road. The Eagles do have a great defense, but their offense can’t continue to sputter. They needed to pull trick plays out of the bag in Week 1 to eke out a win. Quarterback Nick Foles had just 117 yards passing, which is pretty ugly. They also got a lot of help from the Falcons, who couldn’t do anything with multiple red zone opportunities. Don’t expect to see another All-Pro effort from Fitzpatrick, but it may only take 17 or 21 points for the Bucs to win this game. They might be better than we expected, so we’ll take a flier on them to pull the early-season upset. We like the Bucs at +143 with 888Sport.